Are you looking to add some spicy Cajun flair to your next shellfish appetizer. These grilled oysters will hit the spot perfectly. Recipe courtesy of Steven Stryjewski. Heat a gas or charcoal grill to medium-high (400°F to 475°F). In a food processor, pulse together the butter, lemon zest and juice, parsley, hot sauce, garlic, Espelette pepper, and cayenne until well combined. Season to taste with salt, pepper, and additional hot sauce. The compound butter can be made up to 5 days ahead and kept in an airtight container in the refrigerator. Let sit at room temperature for 30 to 40 minutes before using. Grill the oysters with their rounded sides down, covered, until they open, about 5 minutes. 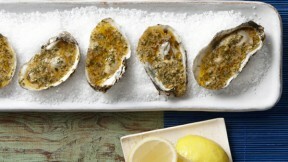 With tongs, carefully remove the oysters from the grill and place on a rimmed baking sheet lined with a kitchen towel. (A towel provides support so the oysters don’t tip over and lose their liquor.) Let them cool slightly and then remove the top shell and discard. Carefully run the edge of a small spoon underneath the oyster meat to release it from the shell. Drop 2 tsp. of the compound butter in each oyster and carefully return to the grill. Cook until the butter is completely melted and slightly bubbling, about 4 minutes. Transfer the oysters to a wide, shallow platter filled with rock salt, nestling them in the salt for stability. Serve immediately with the lemon wedges.